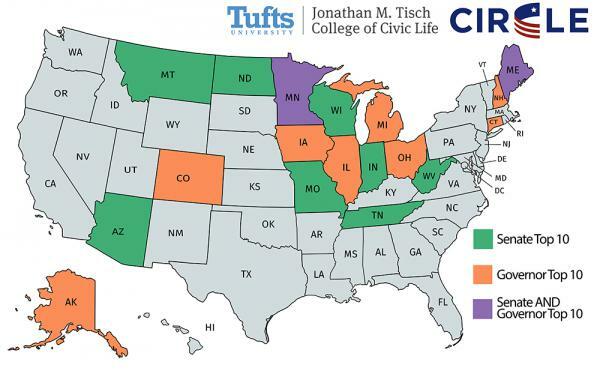 Some Montana college students aren’t content to sit on the political sidelines. Instead they are joining political party groups, registering voters and organizing and sponsoring debates. In fact, the College Democrats chapter at Montana State University Billings is sponsoring a U.S. House debate. Planning for that debate was one topic of discussion at their recent meeting. 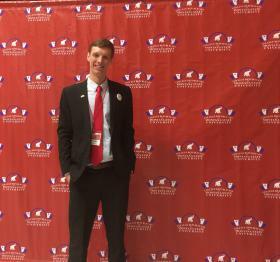 April 12, 2018 at 6:30 p.m.
MSU B College Democrats President Cody McCracken says his parents didn’t talk much about politics, although he says his dad was a Republican. McCracken says his political awaking came in the 6th grade. He remembers the mock presidential election at school. McCracken says he has since converted his dad to the Democrat party. He says his passion for politics is because so much is at stake. Jaime Figueroa agrees. Although he adds he didn’t always feel that way. He says that was especially true when he came to the U.S. from Cuba in 2007. “And I was living that blissful ignorance that I didn’t care about who was elected, who ran the country,” Figueroa says. That changed in 2016 with then-presidential candidate Donald Trump. “I know people don’t run on facts, they run on emotions. But at the end of the day they do matter because they are the bottom line,” he says. Figueroa points to the quote attributed to former Senator Daniel Patrick Moynihan that people are entitled to their own opinion but not their own facts. “So that was part of my wakeup call, I just couldn’t stand so much hypocrisy and lies and ignorance and deceit,” he says. Figueroa says his first vote as a U.S. Citizen was in Montana’s presidential primary in 2016 when he cast his vote for Senator Bernie Sanders. Lauren Harshman, also from Chinook, cast her first vote in 2016 for Hillary Clinton in the primary election. She says it was a memorable year because she also voted for her dad for the school board election. 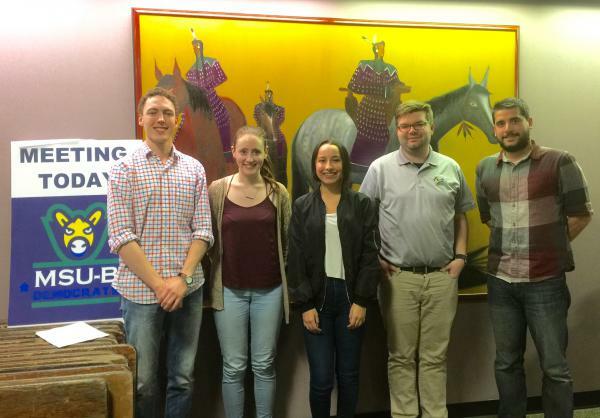 2016 was also the year that the first College Democrat chapter restarted in Montana, according to Richard Wagner, president of the Montana College Democrats and the chapter at MSU. There are now 4 active chapters, soon to be 5. 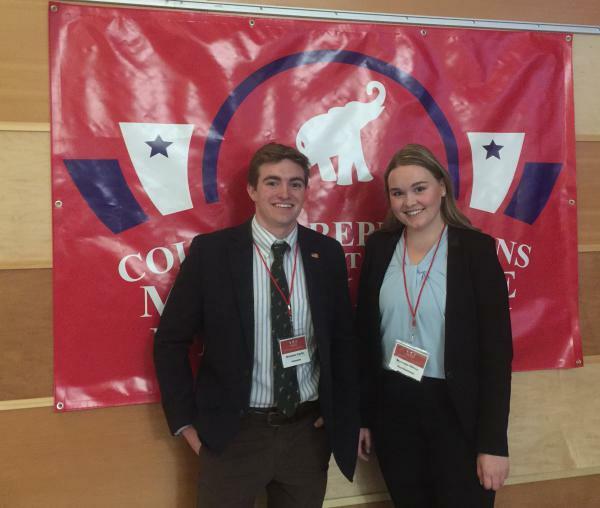 Currently there are 2 chapters of College Republicans in Montana at the University of Montana and Montana State University. “There has been since the election of Donald Trump in 2016 I have seen more democratic and liberal students have become more engaged in the political process then they were before 2016,” says Carroll College Political Science Professor Jeremy Johnson. He says the reverse was true when Barack Obama was president. At first, Justin Hodges didn’t find much interest when he called the first meeting of College Republicans at MSU. He says he sat alone for an hour. The chapter has now grown to over 30 members. Hodges, who’s president of the MSU chapter of College Republicans, says like MSU Billings’ Cody McCracken, his family wasn’t active in politics. But Hodges says he found it wasn’t enough. There was no tangible outcome. College Republicans at MSU put on a GOP Senate candidate debate March 22, 2018 at the Bozeman campus. Melodee Wines says she joined College Republicans as a Freshman. For her it was a way to make new friends as she came to Bozeman from Chicago. Wines’ interest in politics goes back to the 5th grade. “I was watching a speech with John McCain as he was introducing Sarah Palin and I was just like mesmerized for some reason and ever since then I’ve kept up with politics 24-7,” she says. Like many of her peers, her first vote came in Montana’s 2016 election. Wines says making the decision who to vote for wasn’t easy. That was also true for Brendan Carlin who also cast his first vote in 2016 in Montana. “This election as pretty hard for me. I did end up voting for Donald Trump begrudgingly. I didn’t really want to vote for him but I did, so,” he says. Carlin says he grew up in a conservative family that was active in local politics in Rhode Island and Massachusetts. He says his interest continued as a MSU student. “I got interested in politics specifically on campus just because it seemed like there wasn’t as much of a conservative voice on many campuses around the country and I wanted to be part of making those voices heard,” Carlin says. Montana’s millennial voters have the potential to have a big impact in this year’s mid-term election, particularly the U.S. Senate race, says Kei Kawashima-Ginsberg of Tufts University. She’s director of the Center for Information and Research on Civic Learning and Engagement (CIRCLE), a non-partisan research center on youth engagement. She says it’s hard to pigeonhole Montana millennial voters into right or left because they appear to mix their political ideology. She says some of those new voters lived through the Great Recession and were influenced by that upheaval. “The millennial voters who may be conservative, many of them are still socially progressive, for example, but has a very strong hold on fiscal conservatism. 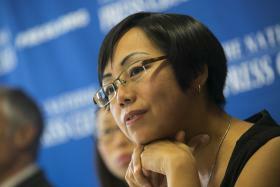 So that’s not your typical Republican who’s conservative on everything,” she says. “Same with a Democrat candidate who may not actually resonate with every young person who really wants to see more progressive vision. So for those young people maybe Democratic candidate maybe isn’t a good fit and maybe they’ll actually chose a Green Party candidate or even Libertarian candidate,” Kawashima-Ginsberg says. The millennial generation is generally defined as those born between 1981 to 1996. According to U.S. Census data, as a group, millennials outnumber Baby Boomers. So they could become a powerful voting bloc. The challenge will be for political leaders to find how to reach out, listen to and engage such a diverse group. Kawashima-Ginsberg says what’s notable about this cohort in Montana is they have already have a relatively high voter turnout, because of that a recent Tuft’s study placed the state #4 for its Senate race and where the youth vote could matter the most. “And so in a close race like the Senate race where Senator Jon Tester is looking to be elected but where there’s a really strong contender young people’s decision on which candidate can present the vision and the future of Montana in a way that can resonate with them could make a very big difference in a close election like this,” she says. In the U.S. House race, Montana ranked #31. Kawashima-Ginsberg says that could change after the primary if the winner is able to capitalize on the millennial vote. Candidates in the 2018 primaries seeking to challenge Democratic Senator Jon Tester and Republican Congressman Greg Gianforte are meeting in Seeley Lake tonight to answer questions from the Seeley Lake Community Council, local media, and the public. In just over two months, Montana voters will select challengers for U.S. Democratic Senator Jon Tester and Republican Congressman Greg Gianforte. Between now and the June 5 primary, Montana Public Radio is talking with voters about political issues important to them. Dozens of employers and hundreds of students and prospective employees attended the 29th Annual Big Sky Career Fair held recently at the University of Montana. MTPR's Edward O'Brien spoke with some of them. A newly-released poll says almost three-quarters of Montanans say they would vote to continue a property tax that keeps tuition low for state college and university students. That’s according to the University of Montana Big Sky Poll conducted earlier this year by Sara Rinfret, director of UM’s Master of Public Administration program. 'Campaign Beat:' Dems Vs. Greens; Tester's Tough Side; Zinke For Prez? Montana Democrats want the Green Party off the ballot; Sen. Tester shows his tough side in a new campaign ad; Zinke for president? ; Denise Juneau is moving to Seattle; And Governor Bullock says the whims of "the president's morning Twitter habit," aren't enough reason to deploy the National Guard. Sally Mauk, Chuck Johnson and Rob Saldin discuss these stories and more on this episode of "Campaign Beat." 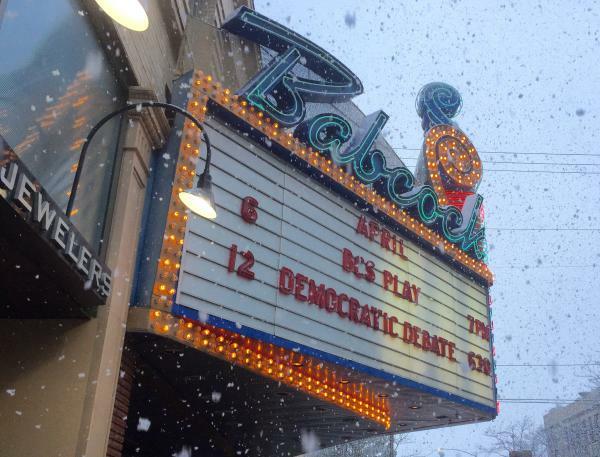 Catch up with the latest Montana election news now.